State of the art security system, monitored 24 hours. Villa Del Oso in Sayulita is perfectly located at the edge of a pristine stretch of beach at the peaceful north end of town. Villa del Oso offers breathtaking views overlooking the Pacific Ocean. The property is set on a massive 105,000 square feet block with the villa covering 20,000 square feet. The property has been built with meticulous attention to detail. 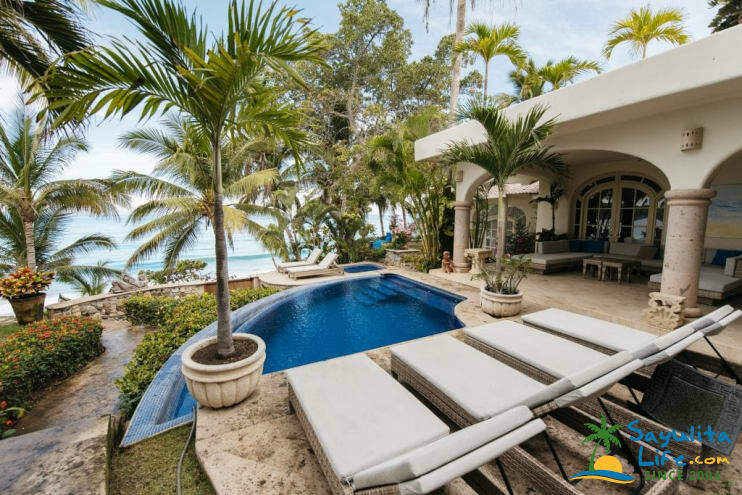 With its exquisite Mexican art-filled interior design, immaculate lush gardens, modern décor, sun-filled rooms and expansive entertaining areas, Villa del Oso is a palatial oasis offering amazing ocean front living. In addition to the main house, Villa del Oso also offers a private, self-contained, two-story, two-bedroom guesthouse with its own spectacular ocean views. There are a total of seven bedrooms – five in the main house and two in the guesthouse. All rooms have bathroom en-suites, while three have a Jacuzzi. Villa Del Oso is also Sayulita's most exquisite location to host a wedding or special event. Please view our event venue page here. With soaring ceilings, a canopied king-sized bed, marble floors and a private bathroom with Jacuzzi, twin hand-carved marble sinks and large shower for two, the Oceanside Suite is pure luxury. This spectacular room with its uniquely shaped domed ceiling and a king-sized bed opens up to an outdoor living area, heated infinity pool and ocean-view Jacuzzi. This room features an illuminated vaulted ceiling, marble bath and a draped queen-sized bed. Bi-fold doors open onto a private garden with a hand-carved stone fountain. French doors open to an intimate rooftop garden - terrace and the sights and sounds of the ocean. A queen-sized bed and marble bathroom completes this majestic terrace suite. French doors open to an intimate rooftop garden and palapa. A queen-sized bed and private bathroom with full marble finish round out this spectacular second floor suite. With its very own private Jacuzzi, super-size outdoor shower, and a king sized bed overlooking the Pacific Ocean, this suite is a private oasis full of tranquility. Like the 2nd floor Tree House Spa Suite, the Garden bedroom has its very own private Jacuzzi and romantic super-size outdoor shower. Please use the contact form to get in touch with any questions and to request a reservation. We look forward to welcoming you to Villa del Oso in Sayulita! This house is definitely one of the most private and secure houses in Sayulita. It also enjoys some of the most magical views away from the busy city center. The service was 5 star and house manager was always available when we needed them. The food was excellent.I sadly do have to mention the fact that my 90% of my group got sick from the norovirus, caused from Sayulita's sewage issues. If you do plan a trip here, do research on the issue, and make sure you are prepared with medicine (nausea, diarrhea, etc.) and hydration drinks. We were not aware how bad this issue was and we were not prepared. I would suggest not bringing any small children. We stayed at the Villa del Oso for a week and had our wedding here. I could not have imagined a more stunning venue. The villa is in a great location on the quiet end of the beach but still super easy to get into town. There was plenty of space for the whole group and we had an absolute blast staying there. The staff was excellent, they really go the extra mile to make sure your stay is ultra comfortable and they so quick to respond to any request or need you may have. There is on site security so we always felt safe and secure. The breakfast and lunches they cooked for us were fantastic, not to mention the endless supply of fresh squeezed juices. The entire week including the wedding was absolutely perfect! The only bad part is having to leave at the end. Thank you Luisa, Eduardo and the rest of the staff for a week we will truly never forget!!! Beautiful grounds, great staff, fantastic location. We have just concluded our 9 day stay at this beautiful property. Staff of 9 comes along with this property. The staff was all fantastic. Do be prepared to tip generously in cash at the end of your trip. Love sitting up above the ocean and almost deserted beach. The ocean is very loud here so we slept with windows closed most nights. Home is clean but was a bit outdated. Was a great place for the price. Our daughter was recently married at Villa del Oso in Sayulita and the wedding could not have been more beautiful. The home is a perfect wedding venue and was large enough to accommodate our entire immediate families. It is located on the quiet north of town end about 15 minutes walking distance to the town center. We rented golf carts but a number of our folks enjoyed walking the beach to town. The home and grounds are exquisite and the staff was very accommodating. Luisa was a big help in many ways to make our stay just perfect. The most excellent 5 days of our lives! We attended a wedding at Villa del Oso and were fortunate to be invited to stay at the Villa with the family. What a beautiful place! The house was beautifully decorated, with most bedrooms having ocean views; the grounds perfectly manicured; the staff attentive; and food prepared on site was delicious. Thoroughly enjoyed every minute of the 5 days we were there. The experience of staying at Villa del Oso is so exceptional, I honestly don't know where to start. I hosted my wedding at Villa del Oso this past month and stayed on the property for one week with family, and it was beyond our wildest dreams. Everything about it was 5 star luxury. The Villa itself is insanely gorgeous - There is a beautiful ocean view from almost every room in the house, the property itself is perfectly manicured, and they offer any amenity you can think of. I asked where to locate an iron to iron my outfit and a member of the household staff literally steamed it for me right there on the spot! The breathtaking views and beauty of Villa del Oso are only matched by the one of a kind service. The property manager Luisa is always available and so helpful and the household staff is exceptional. From the breakfast of our choice they prepared for us each morning to the always incredibly clean and tidy condition the housekeeping team kept our bedrooms to the around-the-clock property security, we felt like royalty, and while the staff was always available and happy to help with anything at all, we never felt like we were being intruded upon. Everyone is so professional and friendly. Our family is still talking about our stay at Villa del Oso and as much as we talk about how incredible the actual villa is, we talk about how fabulous the household staff is and how much we miss them! That's a true testament to the quality of the team at Villa del Oso. These folks are one of a kind. As for the actual wedding, it was completely unreal. You really can't ask for a better backdrop than Villa del Oso and what's more, we were blessed with an amazing pink sunset. I honestly don't think our friends and family will ever stop talking about how beautiful the venue was. Beyond being such a gorgeous location, it was also incredibly comfortable and convenient for our guests, creating a very smooth flow of events from ceremony to reception. It was perfect to have family stay on property too so that the elderly family members could easily go up to bed when they wanted. Overall, Villa del Oso is top notch, 5 star all the way. It exceeding all of my expectations and I feel so lucky to have had the opportunity to stay here. Book this place fast, I swear you will not be disappointed!!!! Pictures don't do this place justice! From the moment we arrived we knew that we landed the perfect wedding venue for our 60 guest wedding in April 2017. The house was used as a residence for some of the family members and the Casita was used for the Bride and Groom quarters. Absolutely the perfect set up! It was wonderful having the staff available the week before the wedding. They took meticulous care of us, prepared wonderful food, had a variety of menu options available (the cost of food is not included in the rental price), and everyone was so pleasant! Rooms were spacious, well appointed, clean, and very comfortable. They AC worked great and the outdoor showers were our favorite! The gardens, beach, and general views of Sayulita are unmatched. Perfect for what we wanted! Also, a security guard was present around the clock and we felt VERY safe. No issues with robbery or mischief of any kind. The pool is very small - really a dipping pool as there's not enough room for a floaty or many people. The property is beach front though the beach is not a swimming beach as the waves were enormous! Such a wonderful sound to fall asleep to! Would love to return again. NOTE: The main house must be rented for the Casita to receive the same service (house staff, cooking service, etc) which is the only reason we gave this place a 4 star rating. My husband and I stayed 2 additional days after spending lots of money (rental fees for the house & Casita as well as an additiona venue fee) only to find out we didn't get the staff for the last 2 nights stay after or wedding. That was a disappointment for sure! Also, the stone wall was full of graffiti making the appearance of the property from the beach not as wonderful as one would hope. Amazing retreat with family and friends! If you need to escape the hustle and bustle of life's hectic pace, Villa del Oso just melts the stress away and was just what our group needed! We were looking for a place that could accommodate a group of our size and offer a relaxing vacation, where we could all spend quality time together, yet sneak away to a reading nook as well. The staff arranged spa services (like massages and pedicures) for those who wanted, and they came to us. Sayulita itself is friendly and fun, with quaint shops. With all the many restaurants to choose from, we decided to have progressive meals/appetizers as we made our way to and from the village. Everyone at Villa del Oso would like to thank you for your recommendation! We are pleased to know that you and your family had a great time in Sayulita .. We hope to see you back soon. We loved Villa Del Oso and the staff. We paid a big price to be married there and rent the entire villa for a week. We were thrilled with the experience until the end. It turns out the Casita was robbed before we stayed there and no added security was in place (there was a night guard but it did not help). Also, they did not tell us about the robbery the neighbors did. We tried to ask for more security but did not get it. we followed every precaution they advised locking all that could fit in a safe up and locking each door when we left. We had to miss parts of our planned adventures to always have someone at the house as my wedding dress and other belongings that would not fit in the safe were not secure without daytime watch. At the end of the trip sure enough we were robbed ourselves. Thank God we weren't there. They tried to get into the safe but could not but did take our valuables that did not fit in the safe. It was invasive and ruined the last part of our trip. They offered no payment for stolen items or compensation for the last night of our trip being ruined. They had this all on video as well! IT was a terrible experience and they poured salt on the wound. Paying 14k$ plus a week to stay here the the least they could have done was refund the casita which was not safe to stay in. We are appalled. I am so sorry for this unfortunate incident! The safety and satisfaction of our guests is always our top priority. To that end, Villa Del Oso has a 24 hour monitored video security system, employs a night watchman, and offers guests high quality safes in all the bedrooms, as well as very solid doors and locks. As a result of this incident, we have put a padlock on the villa service door, are putting heavy bolts and locks on the windows overlooking the jacuzzi, as well as hiring a 2nd security guard from 3-7 p.m. when there isn't staff on site. In future the closets in each room will have a lockable section for additional items. We can install the most secure locks,, but they won't help if guests don't use them. With regard to the previously mentioned robbery, the valuables were left out on the kitchen counter and the doors were left unlocked. This is a resort area, and there will always be those who look for opportunities to steal things. Had our wedding in Nov /14 - place beat all expectations. Staff was more than accommodating, and management was understanding when we had to make changes on day of due to inclement weather. Breakfast A+++ - Grounds well maintained and easy walk into town along beach. There is a minimum stay of 5 nights from weekend to weekend during high season, or 4 nights during low season.